Western Madeira, the peaceful location of our holiday home in Madeira. The quiet Western Madeira, really the island’s best! ‘Raposeira de São João’ is an ideal base for all kinds of activities that make a stay in Madeira so attractive. There is one of the famous ‘Levada walks’ nearby: at a distance of only 200 m there is a connection to the Levada Nova that runs from Prazeres to Ribeira da Vaca near Ponta do Pargo. If you don’t mind a small climb you can also get your fresh bread in the morning on foot, in the bakery of Panoeste who caters for all of Western Madeira. They will happily serve you a delicious ‘bica’ (espresso coffee) or ‘chinesa” (cappucino) or anything else you might like. In the new supermarket near Prazeres (exit Lombo da Rocha at the Prazeres roundabout) you will find most of your daily shopping needs. There is a cash point next to the supermarket. On the opposite side of the Prazeres Roundabout you will find the nearest petrol station. It is the only one in Western Madeira, the next ones are in Estrela da Calheta and in Porto Moniz. For a larger supermarket you take a leisurely drive to Calheta. The ‘Pingo Doce’ (sweet Penguïn) has a complete assortment. In Calheta you will also find one on the few (man-made) sandy beaches in Madeira. On the marina boulevard and in the main street there are plenty of restaurants to have a delicious lunch or dinner. 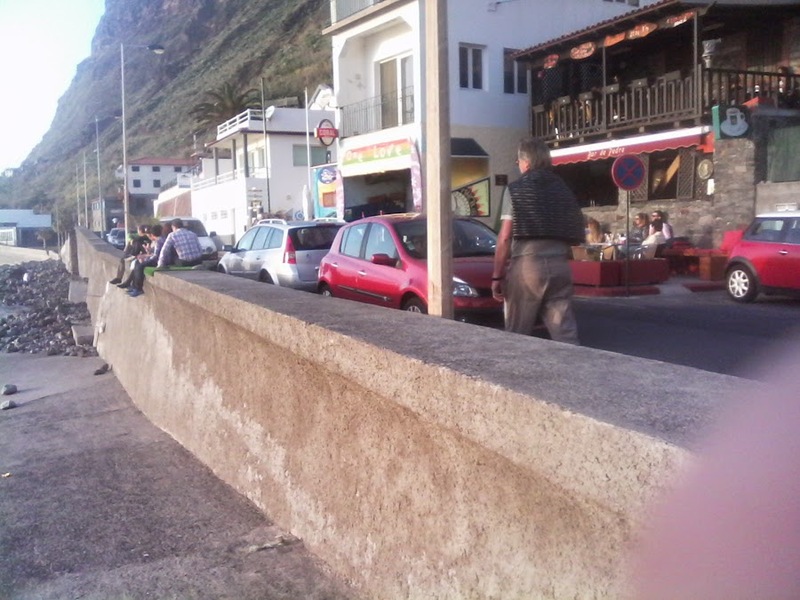 You will be pleasantly surprised by the prices of eating out in Madeira. The small shoppng centre also has a cash point. Another cash machine can be found is in Paúl do Mar. 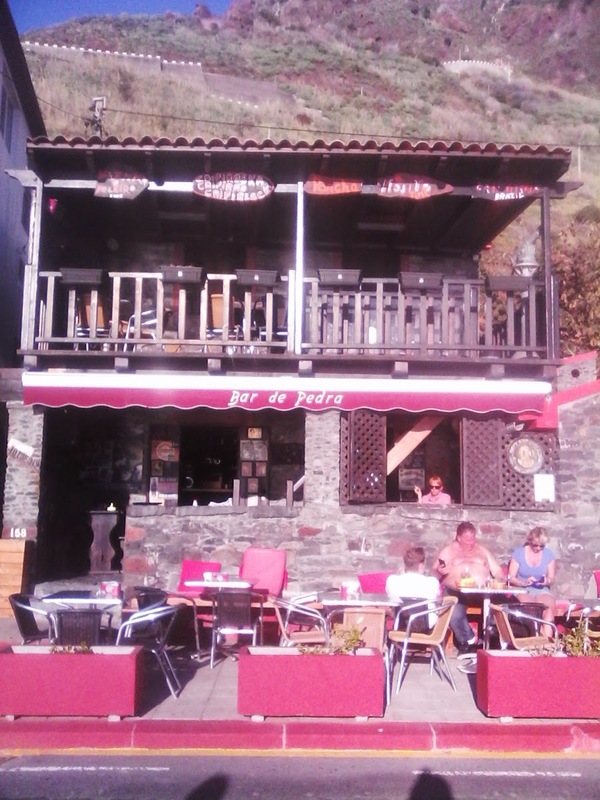 Treat yourself to a drink or lunch in ‘o Precipicio’ (the abyss), a small bar and restaurant that balances on the edge of the steep cliffs with a breathtaking view on Paúl do Mar and the road winding down towards it. The road seems more challenging than it really is, you will pass through some ancient tunnels, coursly cut through the rocks, some of the oldest in the island that were made to end the isolation of Paúl do Mar, that could only be reached over the sea not too long ago. The once decaying village is gradually being restored. Now, it is a picturesque place. Take it in having a drink under the ficus tree near the old fishing harbour. But the place we are really ‘regulars is the Bar de Pedra ‘O Poleiro’, on the extreme west of the village, the part that is called Ribeira das Galinhas heet. 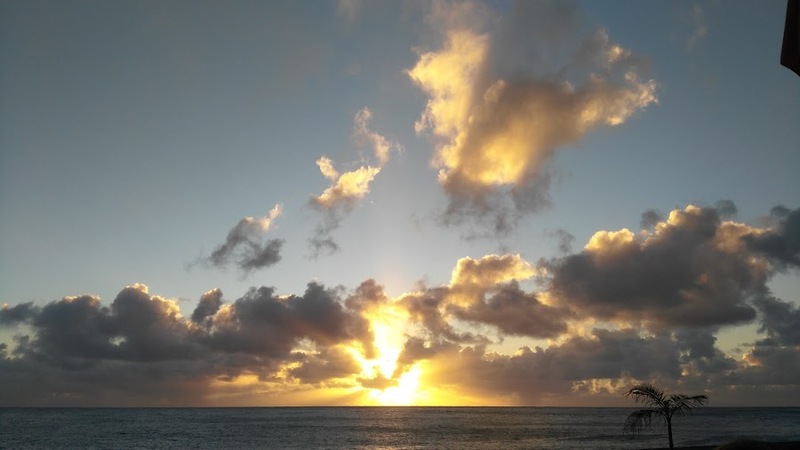 We often find ourselves here for sundowners, watching the often spectacular sundown. They make a mean Poncha, but they also love to make you an exotic Caipirinha or Mojito. From Paúl do Mar, a new tunnel now takes you to Jardim do Mar, a network of flowering alleys form a characteristic village that is very much worth visiting.Going in Northwesterly direction from ‘Raposeira de São João’ you can follow the ER222 to Porto Moniz. A scenic road, taking you through refreshing eucalyptus forests with – depending on the season – abundantly blooming shoulders with agapanthus or hydrangea. The blue and white is regularly varied with the bright orange nasturtium that grows and blooms everywhere in the wild in Madeira. The final descent to Porto Moniz gives a spectacular panorama of the steep cliffs and the ocean. Madeira at its very best. You wish to see some more of the island? Then, please, visit www.visitmadeira.pt (choose a language top-right) or watch the webcams of Madeira!